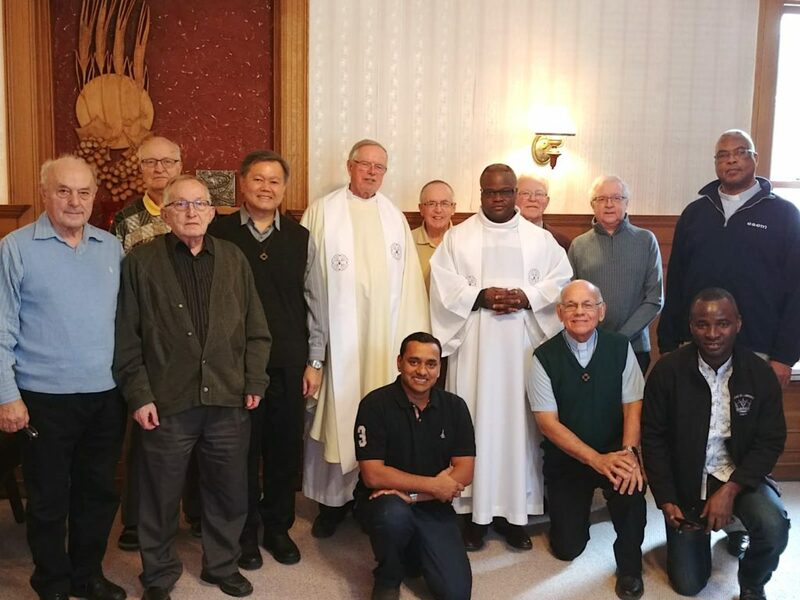 After the consultation of the members of the Canadian Region and the appointment by the Superior General and his council on Tuesday, December 18, 2018 the new council of the Region of Canada will consist of Frs. Richard Woodbury, John van den Hengel and Yuliwan Maslim. This week we received the Christmas letter of 2018 from the General Administration in a number of languages. You can download a PDF of the letter at one of the following links. Voici est la lettre en français et en anglais. Click here to access all of the languages from the general website. During the regular Wednesday audience of Pope Francis on November 21, the General Administration accompanied by a large number of the Rome community were in attendance and received a special mention and a photo opportunity with Pope Francis. During the General Chapter of July 2018 it had not been possible to arrange a special audience because Pope Francis does not schedule audiences in the month of July. Pope Francis took some time to acknowledge the General Administration. 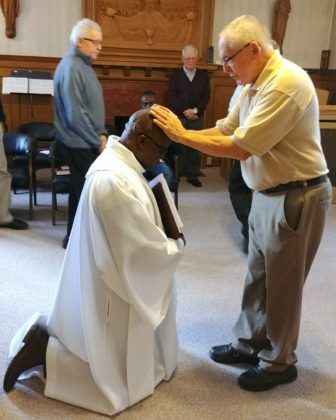 When he approached the group he remarked, “And who will be your next bishop?” referring to fact that our last Superior General was ordained a bishop this year. In the pictures we see Pope Francis greeting our Superior General Carlos Luis Suarez Codorniu, and a group picture of the Roman community with Pope Francis. Le 29 novembre 2018, le P. Gustave Lulendo est officiellement devenu citoyen canadien, au cours d’une cérémonie de citoyenneté, tenue à Montréal, pour plus de 300 personnes originaires de 56 pays différents. Pour l’occasion, il était accompagné du Fr. Dieudonné Tchouteu et du P. Louis-Marie Butari. On November 29, 2018, Fr. Gustave Lulendo officially became a Canadian citizen, during a citizenship ceremony held in Montreal for more than 300 people from 56 different countries. For this occasion, Br. Dieudonné Tchouteu and Fr. Louis-Marie Butari came with him. WILLYANS PRADO RAPOZO, SCJ shared his experience of Canada Immigration and Citizenship at a recent meeting of the North American Migration Committee in Toronto. Will, a member of the Brazil Sao Paulo Province, arrived in Canada in October 2012 and was granted a Religious Workers Visa. In June 2013, the Congregation was entrusted with the care of St. Thomas More and Our Lady of Rosary Parishes. Will was appointed the associate pastor. In January 2015, Will was appointed pastor of St. Thomas More and administrator of Our Lady of Rosary Parish. 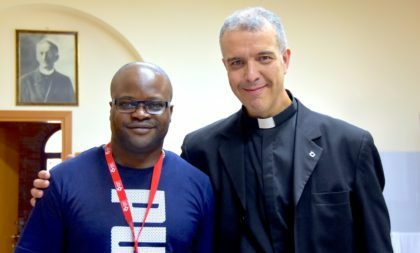 Attending the 2016 World Youth Day with a group of 12 youth from St. Thomas More Parish, he experienced difficulties re-entering Canada and had to return to Brazil to submit a new application, which was granted one month later. In January 2018, Will was granted approval to begin a Masters of Theology at Regis College, Toronto. To do so, he began the process of changing his immigration status from Religious Worker to Student. He was assured, both by Regis College and by Canadian immigration authorities, that there would be no problem. Simultaneously, Will also applied to be a permanent resident of Canada. In July 2018, he received notification that his application for a Student Visa had been denied. He still waits with hope that his application to be a permanent resident will be accepted. In the interim, he is no longer accepted as a student at Regis College and their next acceptance date for his program will be September 2019. Disappointment tinged with exasperation, both on Will’s part and on the part of the members of the Toronto community, has led us to a deeper understanding of what newcomers to Canada experience as they too encounter barriers. Will felt that his experience has led him to risk to engage in more compassionate encounter(s). 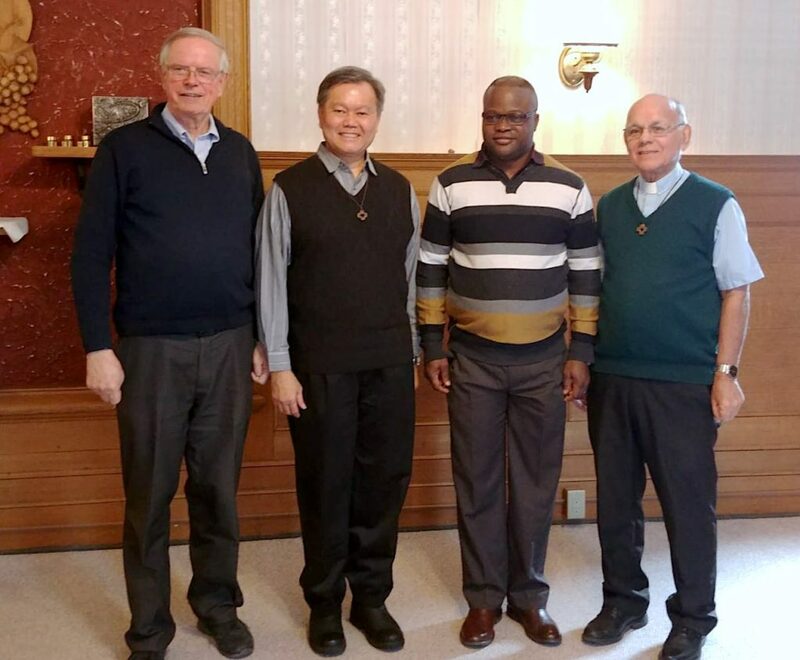 Le Supérieur Général, Carlos Luis Suárez Codorniú, a nommé le p. Gustave Lulendo N’dotoni Supérieur Régional du Canada. Le premier triennat commencera le 16 janvier 2019. 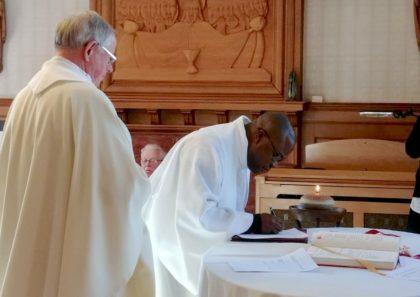 Our congratulations to p. Gustave and we wish him a fruitful ministry in our Region. His ministry will begin on January 16, 2019.